Learning begins with questioning. A lesson unquestioned is at the risk of becoming a lesson unlearnt. In recent times, I have observed that teachers urge their students to read, but seldom do students question the need for reading. This was the case at the Siddharth Memorial Charitable Trust, Noida. Students here were reading, voraciously at times, but without questioning and that is where we failed. I realized that the time was ripe for students to discover the joys of reading and not merely engage in it as an activity which will lead to some good in the distant future, but understand the beauty of the reading process. I held a session for the students of class 9 and 10 wherein we read a chapter called ‘Joys of Reading’ from the book ‘Discussions on Youth’, Volume I, written by the Buddhist educator and philosopher, Dr. Daisaku Ikeda. I omitted parts which mentioned Buddhist concepts, keeping in mind the value of secularism which the Trust earnestly follows. Several issues related to reading such as it being a chore nowadays rather than a pleasure as against watching TV, and the lack of time to read amidst busy schedules was discussed in detail. At the same time, the opportunities that reading inherently opens up such as equipping a reader/person to engage in a dialogue with philosophers, sages and great men was a valid point which was joyfully accepted by the students. They were happy when they realized that they could dwell deeper into subjects and topics of their individual interest. As against studying pre-decided subjects which they found monotonous at times, this appeared to be a passage towards their self-expression. Also, the fact that television and comics in most cases carried pre-packaged imagery and consequently curtailed one’s imagination was a ‘point of serious reflection’ by the students. Once we arrived at the understanding that a ‘good book’ should ideally be ‘old’ and of one’s interest, I designed a simple activity. 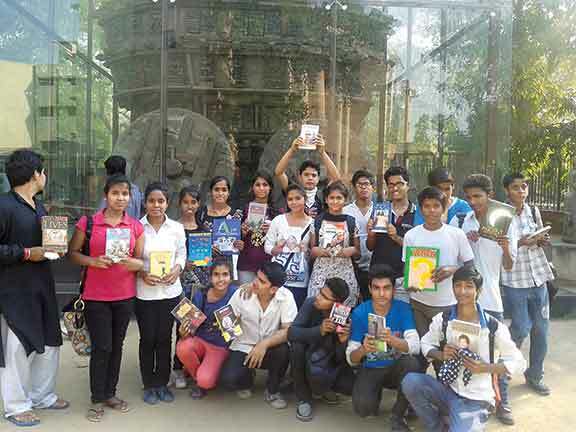 All 20 students were given Rs 100 each and 90 minutes of time in Delhi’s flea book market at Darya Ganj on a Sunday. They were asked to purchase a book in any language of their choice, which would add value not only to them but also to the junior students of the Trust in the coming years as well. The result was satisfying. We had converted thoughts and dialogue from the classroom into action. Students chose books of their interest which varied from books on famous scientists to art to books about our neighbouring countries and even spirituality. The concluding result – students have set daily reading targets, either time or page wise. And I, as a co-learner, hope that the students and I go on to sediment our habit of reading. And lastly, I too was extremely lucky to find a book first published in 1943, called Van Loon’s ‘Lives’ written by Hendrik Van Loon, which appears to be a sumptuous treat. The author is currently a student of M.A. in Social Entrepreneurship at the Tata Institute of Social Sciences, Mumbai. He is also a visiting co-learner for the Service Learning program and a member of the Siddharth Memorial Charitable Trust in Noida. He is inclined towards education and human-centered development which he is exploring as part of his course. He can be reached at manikdhingra@gmail.com.